“He has showed you, O man, what is good. And what does the LORD require of you? To act justly and to love mercy and to walk humbly with your God” (Micah 6:8 NIV). The important thing to note is these values — and the supporting virtues — are all interconnected. You can’t pick and choose among them and expect the others to work. It is not a list of disciplines, but rather a system of principles for a right relationship with God, and with each other. Justice: I will be fair and reasonable in the way I treat people and make decisions. 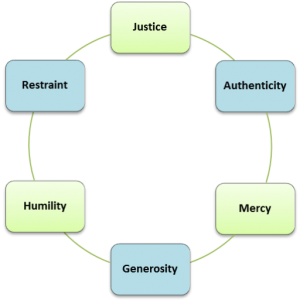 Mercy: I will be kind, sympathetic, compassionate and understanding. Humility: I will be modest and respectful, always looking for the best in others. Authenticity: Because I value justice and mercy, I will be authentic, genuine, truthful and transparent. Generosity: Because I value mercy and humility, I will be generous, willing to help or give freely. Restraint: Because I value humility and justice, I will be restrained and disciplined in personal and public activities.